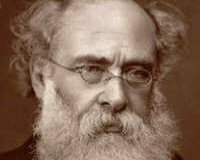 Description: Anthony Trollope (24 April 1815 6 December 1882) was a remarkable man. After an unhappy childhood, and an unpromising start to his career, he went on to write 47 novels and rise to the top of his profession as a senior civil servant in the Post Office. It was not until Trollope was in his thirties that he began to write. His early novels, written in Ireland, met with little success, but once back in England in the 1850's Trollope's Barsetshire novels firmly established him as a literary success. Alas the house that Trollope was born in has now gone but his spirit lives on.